Soldiers from Eagle Troop, 2nd Squadron, 1st Calvary Regiment, 1st Stryker Brigade Combat Team, 4th Infantry Division dismount a UH-60 Black Hawk in preparation for a foot patrol in Afghanistan, Sept. 4, 2018. For the Taliban, "with regard to troops, that was their most important issue,” Khalilzad said. As part of these initial talks, “we have agreed in principle on a framework for possible U.S. withdrawal,” Khalilzad said. A Taliban spokesman told news agencies this week that the U.S. had agreed to remove half of its forces by May as part of this round of talks. Khalilzad said the talks are still in the very initial stages. To date, the Taliban has not agreed to meet with Afghan government officials directly and Khalilzad said that reluctance is likely to continue through Afghanistan’s July 20 presidential elections. Both of the two agreements would have to be taken up by the Afghan government, along with a host of other issues. 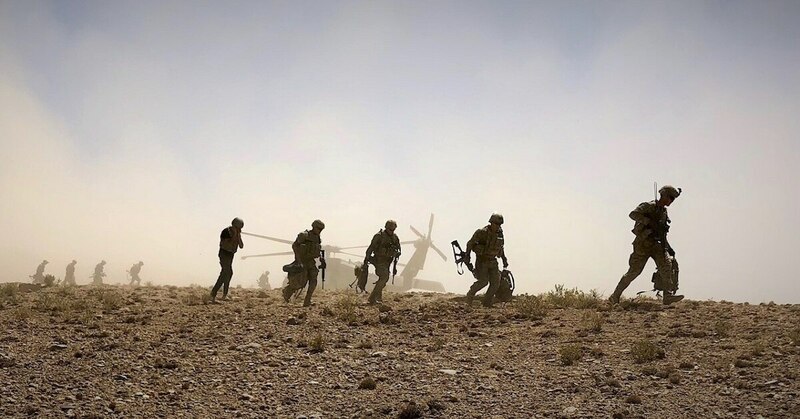 In December, U.S. defense officials confirmed that the U.S. was considering withdrawing as many as 7,000 of the approximately 14,000 U.S. forces deployed in Afghanistan. Now those plans “are in a holding pattern, to see what Khalilzad comes back with,” another official told Military Times Friday. For now, “the mission continues,” the official said, on the condition of anonymity. Until talks between the Taliban and Afghan government officials can be held, “we will engage the Taliban further to flesh out these commitments that they have made,” Khalilzad said. Khalilzad did not say whether the U.S. plans to withdraw all forces, or just reduce its footprint and keep a long-term force there. He added that even though President Donald Trump would like to withdraw forces, Trump will not do that if the U.S. perceives there is another terror threat taking root there. “We are not seeking permanent bases in Afghanistan,” Khalilzad said. “Our vision long term is for an Afghanistan that is entirely sovereign, independent and if they decide they don’t want to have foreign troops, we don’t want to stay where we’re not wanted — provided that there is no threat to our national security from Afghanistan,” Khalilzad said.